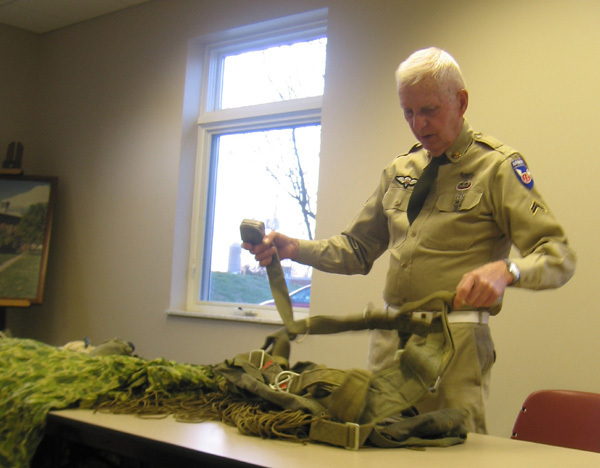 May 25 thru July 4. . . .
An exhibit of military uniforms and artifacts of local veterans opens May 25th at the Myers Inn Museum in honor of longtime Big Walnut Area Historical Society Board of Trustee member, the late Robert A. “Bob” Cheadle. "Our Military Heroes" features military uniforms from America’s wars and conflicts around the world, along with artifacts and memorabilia, from World War I to the current conflicts in the Middle East. The exhibit, housed on the main floor of the museum, will be displayed from Memorial Day weekend through the Fourth of July, during normal business hours for the museum. In addition to the exhibit, there will be a continuous showing of the life of Civil War General William S. Rosecrans. On Sunday, May 27, Polly Horn will present a program on “Men and Women Who Served in World War II” as published in The Sunbury News during the war. The program about local men and women will begin at 2:00 p.m. in the Myers Inn Meeting Room. There is no fee for the program which last about an hour. Bob was a veteran of the United States Army and served during the Korean War. During his time in the Army Bob became a Master Parachuter, jumping over 50 times. As a trustee of the BWAHS, Bob especially enjoyed taking local 4-H groups and others on tours of the local cemeteries, placing American Flags on the graves of our local veterans. The exhibit will be open 12 – 3 Thursdays, Fridays and Sundays; 10 – 5 Saturdays. Museum will be open 9-3 on Memorial Day, May 28 and July 4th. Exhibit Contact Information: Bill and Sue Comisford, (Bill – 614-403-4356 or bcomisford@maloneynovotny.com; Sue – 614-403-4565 or mcomisfo@columbus.rr.com ).